Business Systems & Consultants’ innovations in storage and material handling include intelligent barcode and RFID platforms. Technology has made controlling, auditing, and tracking inventory easier to manage. BSC effectively demonstrate how you can view real-time inventory levels, track asset usage, and locate barcode and RFID scanning and labeling systems. Identifying reorder levels and unauthorized access is now possible with intelligence provided by the inventory tracking and management experts at BSC. All solutions are extremely cost-effective, personal computer-based software products that can help you dramatically improve the productivity and take the headache out of managing inventory, material, and media. 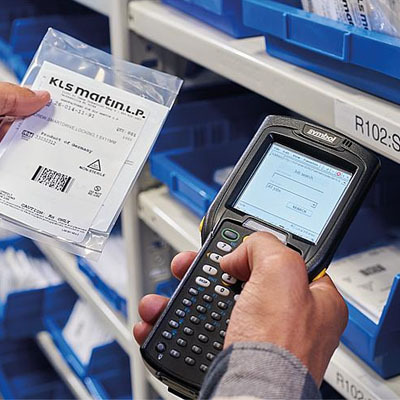 The barcode has been around since about 1950, and these machine-readable codes made up of parallel lines have been used for decades to track and manage inventory quickly and efficiently. But while barcodes have been used successfully in inventory management for years, they do have some disadvantages, and that’s where radio-frequency identification (RFID) comes in. RFID asset tags can be affixed to just about anything to track, manage, and secure inventory, parts, and more. Because they work on radio frequencies, the readers can locate tags at a much greater distance, whereas barcode scanners have to be within a visible range of the barcode to work. Although RFID systems are more expensive than barcoding, the tags are more secure and can hold a great deal more data. However, barcoding is still a practical and affordable option for tracking assets and can be used successfully in many environments. Inventory, parts, and asset tracking and management are crucial in many industries, and technologies that facilitate this can save time and money, increase efficiency and accuracy, and boost productivity. For instance, imagine you were a manufacturer operating on a manual inventory management system, where employees had to monitor and track stock levels physically. Things like human error, absenteeism, negligence, and improper training could all result in a situation where you run out of an integral component, and this could lead to costly and lengthy production delays. When you switch to an electronic system where inventory can be tracked and managed with ease, it eliminates certain possibilities for error, allows you to manage inventory and materials with easy-to-use software, and increases productivity and efficiency. 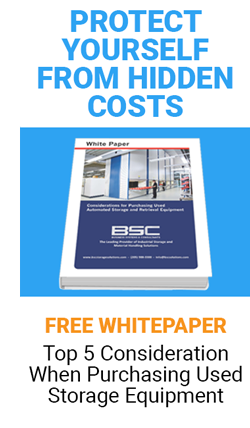 At BSC, we don’t just specialize in storage solutions, because we understand that proper inventory management and handling involves a lot more than just shelving. With the right technology and the right storage solutions in place, you’ll be on track to improve storage areas in your business, maximize available space in your office or warehouse, organize your inventory and materials in an efficient and user-friendly way, and vastly improve the efficiency and accuracy of your inventory management system. With barcoding and RFID asset tracking, you’ll be able to track and manage crucial components, inventory, documents, materials, and more, and this will result in better and more effective business operations, higher productivity, and increased success for your organization. To discuss your asset tracking options, or to get a quote, contact BSC today.